Russia’s ambitions for territorial expansion these days are not limited to Crimea and eastern Ukraine. The Kremlin and Canada are maneuvering to gain control of potentially lucrative areas of the Arctic. In a sign that the competition for energy resources is intensifying, Canada in early August dispatched two icebreakers on a six-week mission to map a key portion of the Arctic seabed around the Lomonosov Ridge. Russia and Denmark also claim sovereignty over this potentially valuable territory. “Given the circumstances, we need to take additional measures so as not to fall behind our partners, to maintain Russia’s influence in the region and maybe, in some areas, to be ahead of our partners. These are our priority tasks,” Putin stated. Analysts have long expected the Arctic to become a battleground for world powers. Glacial ice continues to melt at a rapid pace due to climate change and anthropogenic warming. Over the last several years, Russia and Canada, as well as Denmark, Norway, and the United States, have sent naval missions to the region with an eye toward securing vast energy resources now accessible via new waterways. The Arctic Council has served as the principle international forum for resolving interstate issues covering environmental security and mutual economic development. In 2009, the U.S. Geological Survey estimated that the region contains up to 30 percent of global gas reserves and 13 percent of undiscovered oil. The Lomonosov Ridge, which extends 1,100 miles from Ellesmere Island through the North Pole to the New Siberian Islands, remains most critical to gaining access to Arctic riches. The United Nations Convention on the Law of the Sea rules that coastal nations have exclusive economic rights to natural resources located within 200 nautical miles of their shores. A petition may be presented to extend the zone to 350 nautical miles, depending on specific geographical criteria. In this case, the country must provide proof that its continental shelf stretches from sovereign territory to beyond the initially allotted distance. Such legal parameters explain why the Lomonosov Ridge is of so much import to Canada, Russia, and other competing nations. The state that secures sovereignty over this geological formation can gain control of energy supplies in the region. In December, Canada submitted a proposal to the United Nations for jurisdiction over a section of the Lomonosov Ridge between Ellesmere Island and the North Pole. The recently dispatched research mission is considered the latest move to reassert Canadian interests in the Arctic. 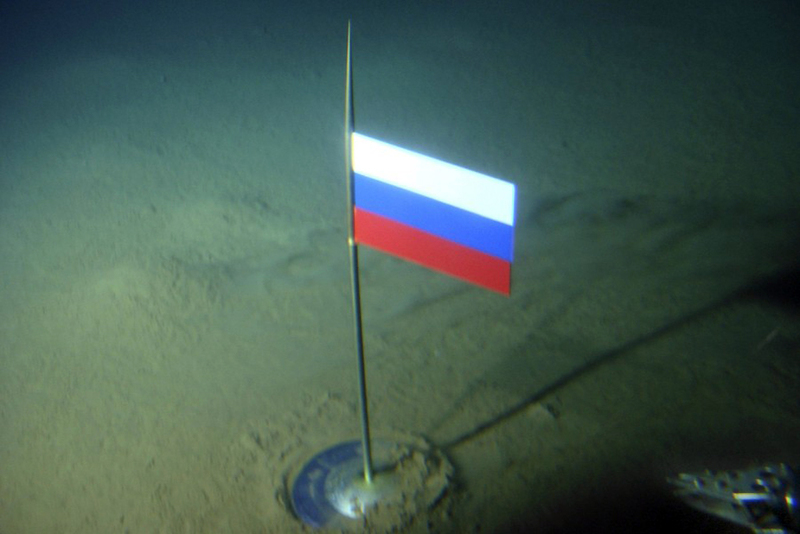 Russia has been similarly active in recent years from planting a Russian flag on the seabed directly beneath the North Pole to restoring military bases and airfields in the region. Robert Huebert, a professor at the University of Calgary’s Center for Military and Strategic Studies, said in an interview with a leading Canadian daily, The Globe and Mail, that overlapping claims in the Arctic would likely lead to protracted and tough negotiations. Deteriorating relations between Russia and the West over the ongoing crisis in eastern Ukraine could prompt Russian leaders to see the Canadian mission as a provocation. “I would suspect they would see this as a continuation of western encirclement. It may be at the point where Putin is willing to push back,” Huebert said.